For a little while now I've been playing with uses for my beeswax. I did order a new colony of bees for next spring but in the interim I had a bunch of wax left over from the previous clean out. After making soap that one time with my friend I decided that soap was too much work for me to only make it once in a while. Lip balms, on the other hand, are rather easy. 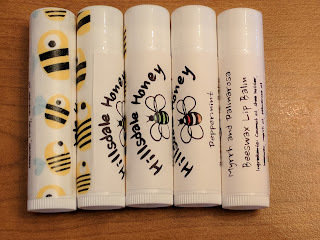 You melt the beeswax over a double boiler with some other oils, add scent, and pipe into lip balm tubes. I have a hand carved wooden spoon that doesn't mind being dipped into these mixtures and that makes it simple. I did need to get some supplies, like a filling kit, extra tubes, some label paper for my printer and various essential oils. Researching on the internet yielded three different recipes - some with honey and some without. Each one had beeswax, some had coconut oil, some almond oil, some shea butter. So I experimented and I decided the recipe I liked best was this one with the coconut and almond oils. It has the nicest texture and the nice part is you can use different essential oils. For the record it makes about 20-21 5-ml tubes. Thus far, I've made the following batches: Myrrh and Palmarosa (smells like roses), Lavender, Peppermint, Honey Lemon, and Honey Lemon Mint. The next part was coming up with a label that worked and my husband encouraged me to draw my own bee for the logo rather than use a clip art one. That way, if I trademark the logo it's original. 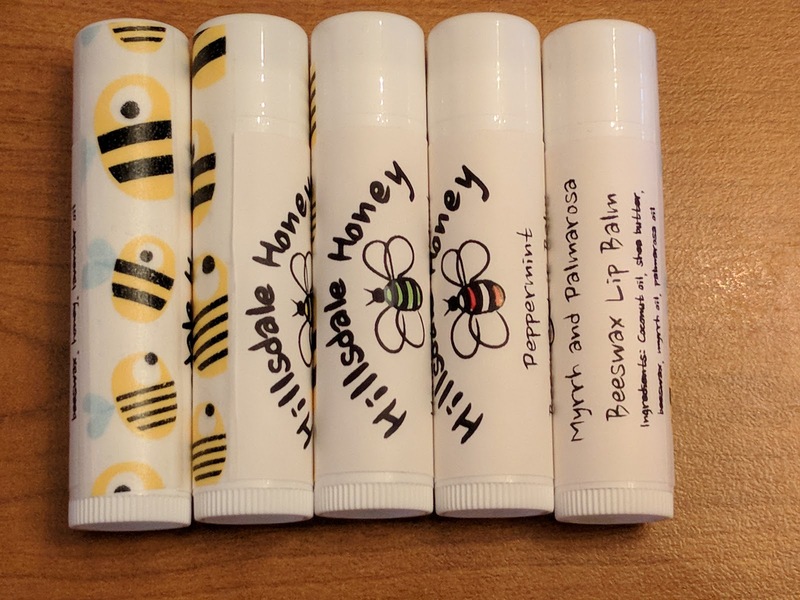 Each type of lip balm has the bee colored in with different sharpies to represent the scent. And since my labels don't seal the cap onto the tube, I use washi tape to finish the seal. I purchased a bunch of washi tape with two different bee designs. I think they're stinkin' cute. Don't you? Most will be given away as gifts, although I did sell some to a realtor friend who will used them for client gifts. I'm almost out of beeswax now but hopefully when I have more in the future I can make more!